Congratulations on #100 Lia! Each one has brought happiness not only to your kids but to me too. Thank you for brightening my day and being such a sweet, kindhearted and generous friend. I'm so happy to have met you through bento! <3 <3 <3 <3 <3!!! Hi Lia, I think it's a excellent idea to put that party hat to celebrate this #100 post. And Lia, I think many people will celebrate this post too because I'm sure many people were inspired by you in making bento, including me. I learn so much by read your blog. selamat mbak buat bento ke 100-nya!!! Congratulations on 100th bento! Looks like a great celebration, love the cute happy bear and all the food in that pink box. Always inspired by your new creations. congratulation!!! Hope i can be better on bento making ^_^ learn from u ya !! hi Lia, congratulations on yr 100th bento ! Look forward to yr many many more bentos to come! Today's happy cute bear is so right to mark this happy occasion. Congratulations on your 100th bento! I would never have imagined that I will also be in that situation in something like 2 or 3 bentos! I would like to make something special for my 100th bento but I still don't know what :P.
wah, selamet ya mbak.... 100 loh!! n it always wonderful, perfect n pretty bento everyday. btw, how can ur picts look so bright n pretty? @Kids Dream Work : Thanks a lot Ai Ping! We might not know each other if not because of bento blogging. 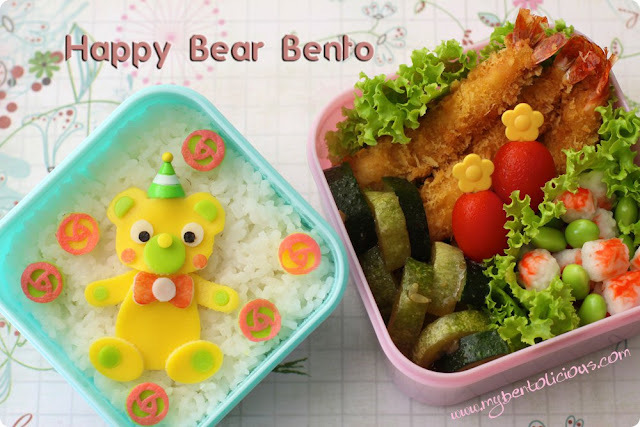 Your bento blog is also so inspiring :) Have a nice weekend! wow, 100 bentos! we are all so lucky to have seen your style evolve and to have learned from the many ideas you have shared with us! this bear is amazing - as usual your egg sheets are perfect, and i love the different colors on his paws, cheeks, and bowtie! the other box looks great, too... those ebi look golden delicious! Wow... congratulations honey for your 100th bento. When you first started I had no idea what bento was. But one thing I knew for sure that when you put your heart and mind into it (and being a perfectionist), you always amazed me with the talents that you have :) Love you. What a happy bento for your 100th! He's so cute. The whole bento looks delicious. Thanks for the information on how to cut the crab stick - I'll practice this weekend! congrats lia!! looking forward to more bentos! @C : Chia, thanks a bunch dear! Congratulation on the 100th post Lia!! I feel so lucky to meet you up here, learning so much from you on my bentoing journey. Wow Lia! One Hundred Bentos! You're a rock star in bentoland ! Here's to 100 more ! Congratulations on the 100th bento! All your bentos look so nice and very appetizing! I still have a lot to make before reaching my 100th bento :) But I’ve learnt a lot from your blog and others blogs. Thanks for sharing! @Judy : Thanks a lot Judy! Dear Lia, Congratulations on 100 splendid bentos that have brought so much joy and inspiration to all of us! So happy to have made friends with such a kind and wonderful artist as you. Here's to 100 more! Congratulation on the commemorable 100th bento! Thank you for having shared with us your ideas and tips of lovely bentos, Lia! @pigpigscorner : Thank a lot Ann! Wow! Congratulation on the 100th bento! What a cute little bear & those food looks so yummy in the other box! sorry, my comment got cut off! love love love your sweet party hat bear, I'm running out of ways to express how darling your work is! Comment from Pauline (Pipaw) via e-mail : Happy 100th bento! This one looks really fresh with its pastel shades! + your bear looks so happy it is contagious! Time flies so fast and here you are with your #100 bento. I'm so blessed to have you as my friend and I can't wait to see your #200, #300, #400, and #... Hehehe :D, Hugs! @tatabonita : Thanks a lot Tata for everything! Very appreciate all your comments, encourage me so much :) Hope we can keep sharing our passion and spread the bento love to others!